Make your own quick and easy vegan red Thai curry paste and cook this delicious version in next to no time. Prep ahead cooking at its best. Make as fiery or as mild as you like. A simple Thai curry is one of my favourite things to eat – I love the fresh clean flavours of it, the heat from the chilli, the warmth of the galangal or Thai ginger and the freshness of the lime and coriander (I know some people have taste buds that make coriander taste like soap to them; their misfortune (and it certainly is a misfortune), is my gain as it means more for me – I LOVE coriander), same with Lemongrass! I have a terrible habit of making curries too hot, once chilli goes in it is impossible to take it out and as it cooks it gets hotter. I usually end up gulping lots of beer water when I eat to help take the heat away – capsaicin, the compound which makes chilli hot, is soluble in both alcohol and fat, hence the pairing of a curry with beer, or a yoghurt based raita. The majority of ready made Thai curry pastes contain fish paste, dried shrimp or both, so if you are vegetarian, or cooking for one you need to read the label carefully. You can seek out a vegetarian paste, or you can make your own, which I think tastes far better and, of course, is far more likely to impress. This recipe makes enough for 4, so freeze any leftover paste for next time. Serve with a big dollop of my banana chutney. 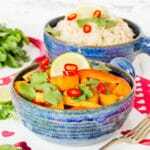 For another fantastic warming vegan bowl why not try my Warm Butternut Squash Salad, 5 bean chilli or my Indian chickpea curry. 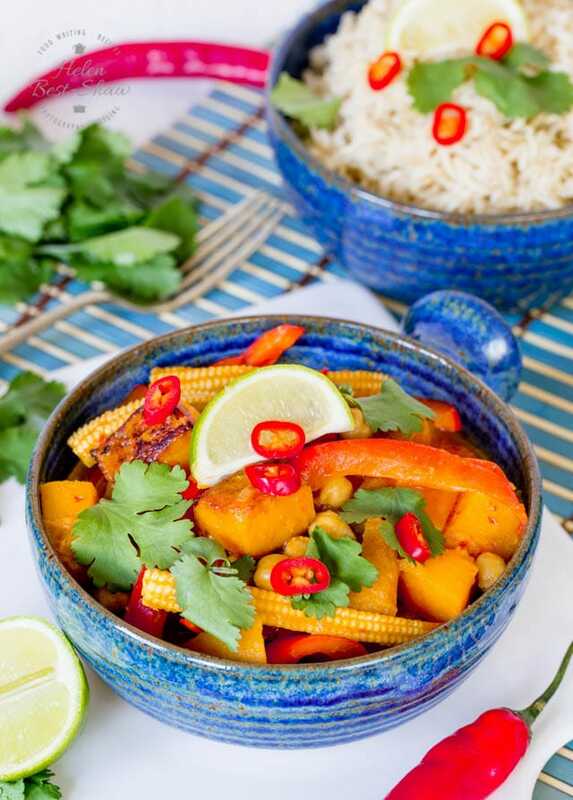 If you try this Easy Vegan Red Thai Curry with Roasted Butternut Squash & Chickpeas please tag #FussFreeFlavours on Instagram or Twitter. It is amazing for me when for me when you make one of my recipes and I really do love to see them. You can also share it on my Facebook page. Please pin this recipe to Pinterest too! Thanks for reading Fuss Free Flavours! Place all the ingredients into a blender or mini food processor and whizz, scraping the sides down from time to time until you have a smooth paste. Depending on your blender you may need to add a little more coconut milk to loosen the paste. Place in a covered container and keep in the fridge for up to 48 hours. Leftovers can be frozen. Peel, and chop the butternut squash into 2cm cubes, discarding the seeds. Drizzle with oil and sprinkle with salt. Spread out in a roasting tin and cook at 200C / Gas 6 - until it is soft and golden. This can be done in advance and the squash either kept in the fridge for 48 hours, or frozen. Pour the oil into a large frying pan pan, add the onion and a pinch of salt and fry until fragrant. Add about half the curry paste and fry for a few more minutes. Add the coconut milk and lime juice and allow to simmer for a few minutes until the mixture starts to thicken. Whilst the curry is cooking cook the rice as per the packet instructions. Add the squash, chickpeas and baby corn to the curry and stir. Allow to cook for a few minutes until they are heated through. 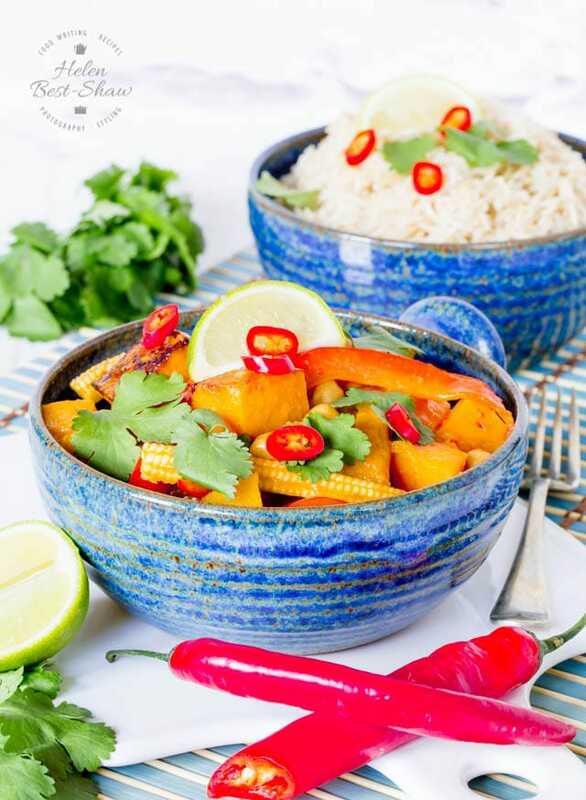 Serve the curry with the rice garnished with fresh coriander and slices of red chilli. Leftover curry paste can be frozen with any extra coconut milk. Adapt with your choice of vegetables.